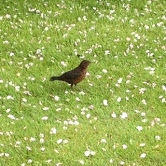 A blackbird amongst the blossom. 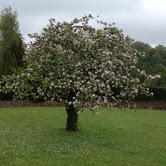 Blossom at more than seventy years old! A New Run For Our Cattle! 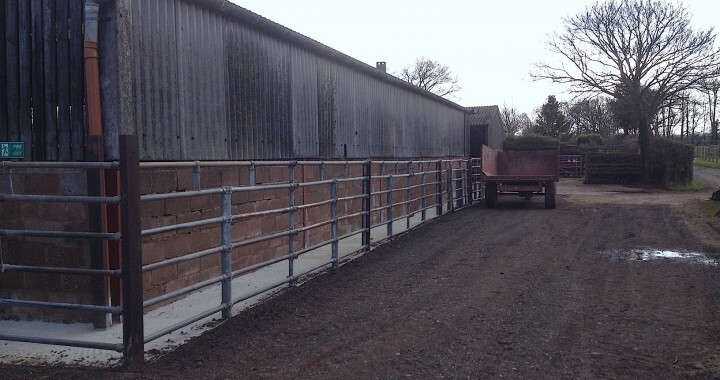 We have recently completed a cattle run in the farmyard to make working with the cattle a little easier. It was all hands on deck when the concrete arrived, and we are pleased with the finished result!! Thanks to all who helped out, more pictures of the cattle to come!!! 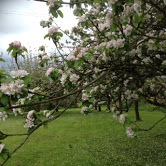 Stogumber ‘Gardens Open’ – Saturday13th and Sunday 14th June. A chance to visit a range of gardens through the village over this two day period. Buy plants and home made produce and enjoy refreshments in the Village Hall. Visit the village website for more details. Our First Trip Advisor Review!! 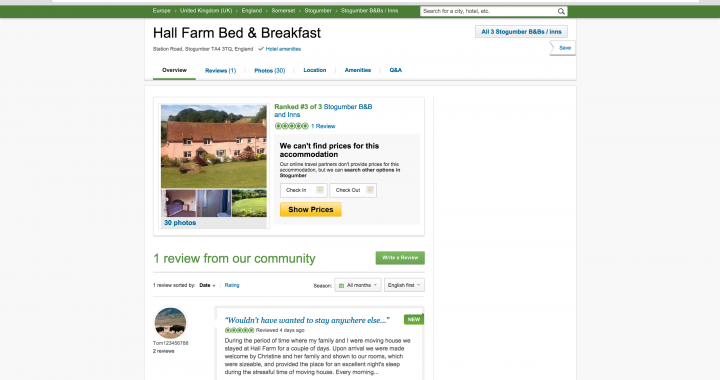 As part of our new website design, Hall Farm has recently become available to review on tripadvisor! We are happy to announce that we have received our first review from ‘Tom123456788’ earlier this week, who gave us 5 stars, out of a possible 5! We would like to thank Tom for his review, and encourage any of our visitors to leave their reviews and thoughts on our Tripadvisor page. Christmas and New Year at the farm has been busy, with decorations being put up for our annual New Year’s Day party, which saw around 70 friends celebrating the New Year with drinks and a buffet dinner. A good day was had by all, and thanks must go to The Fruit and Flower Basket, Bishop’s Lydeard, for providing delicious turkey, cranberry, and stuffing pies! We would like to wish everyone a Happy New Year, and are looking forward to seeing you all again soon. After the farm has been leased out for a number of years, we have now taken it back and are farming it ourselves once again. 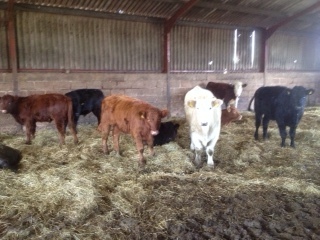 We have just purchased 17 new cattle, aged from 3-6 months old, with more on the way soon! Several breeds can now be found on the farm, including Charolais, Limousin, Blonde-Acquitaine and Hereford. They will be housed inside until warmer weather in the Spring, when they’ll be let out to graze the fields! If you would like to book a room, please contact us via the form provided. Copyright © 2014 Hall Farm Bed & Breakfast. All Rights Reserved. Designed by Edward Martin Computer Services.